I'm sure that most of us know that actual Oreos are vegan. Yes. But who wants to go buy some over processed cookies at the store when you can make your own (even better) Oreos at home?! I don't know about you, but I'd prefer to make 'em. More fun and more opportunities to lick the blender clean! Let me tell you about these Oreo Squares. I made them accidentally when I had some extra cashew cream. I threw together some ingredients and it was almost like a tropical paradise appeared right on my counter top. I say that because it's very wintery here and a tropical paradise would be so so good. But anyways, back to the Oreos. I made the whole batch of them and had them gone in two days. They're not crunchy like your typical Oreo. They're soft and gooey and a pure tasty treat. Give 'em a try, you won't be disappointed. In your blender or food processor, blend together all ingredients. Remove from blender and press out 3 flat rectangles on parchment paper. Set aside. Blend together all ingredients until smooth and fluffy. 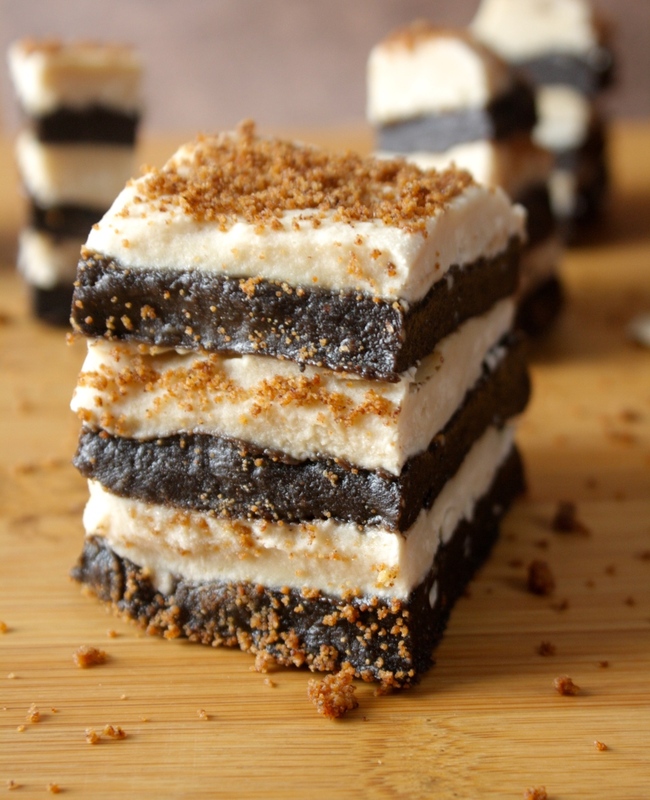 Spread cashew cream on top of each Oreo rectangle. Place in freezer to set up for 1 hour. Remove from freezer and stack rectangles on top of each other. Cut into small squares. Serve, enjoy!